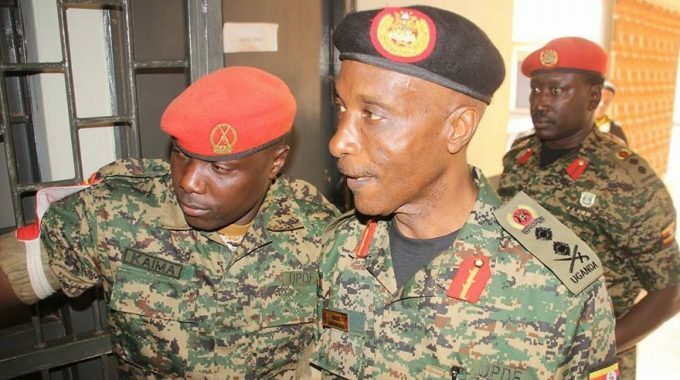 Former Inspector General of Police Gen. Kale Kayihura has on Friday appeared at the Makindye General Court Martial and denied all the three charges read against him by its Chairman Lt.Gen. Andrew Gutti. The charges against Kayihura are; failure to protect war materials, particularly that between 2010-2018 allowed the guns to be used by Bodaboda 2010 gangsters led by Abdullah Kitata. Gen. Kayihura was also charged with failure to protect war materials or failure to supervise and account for guns as IGP under flying squad department. He also charged on the account of aiding and attempting to kidnap Rwandan nationals and patronage. Kayihura has denied all the charges. Kayihura arrived at Makindye General Court Martial this morning to hear the charges against him. He was arrested at his country home in Katebe village, Kashagama sub-county Lyantonde district in June. He has spent 2 months in detention at the Makindye Military Barracks.